It’s time once again for the Game Night Blog Carnival. This month, we’re tying in Game Night with May of the Dead, and covering undead-themed games. Looking through my game closet, I didn’t really have many thematically appropriate games. I’ve already covered Ravenloft this month, so the first D&D Adventure System game, based on that classic adventure, was out. This left me Zombie Dice, a fun little “push your luck filler”, as well as it’s small expansion, the unimaginatively named Zombie Dice 2. Zombies are well known for their insatiable appetite for the brains of the living. 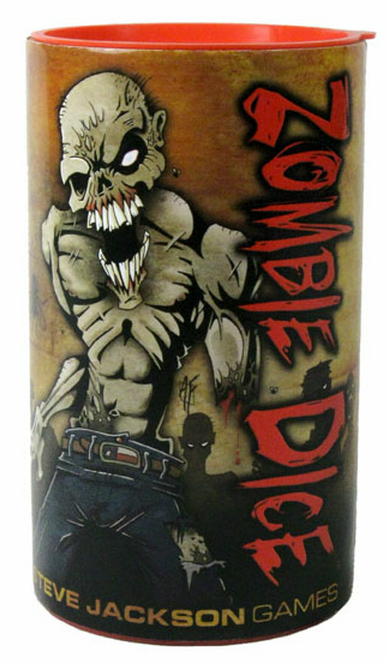 In Zombie Dice, players take the role of a hungry zombie, prowling the streets for humans to prey on. These humans are represented by custom dice, and come with three different faces: brains, shotgun blasts, and feet. Three different colors of dice have these faces in different ratios. Green dice have more brains and less shotguns, yellow are balanced, and red have more shotguns than brains. It’s fun to speculate as to what types of humans you encounter when you roll; a green die might be a little old lady or a toddler, yellows might be soccer moms, and red dice could represent retired soldiers or redneck hunters. There’s no real point to such speculation, other than the fun and often hilarious stories that sometimes develop. Those soccer mom/toddler combos can be dangerous at times! Players roll three dice at a time, and set aside any shotguns or brains. The object is to eat as many brains as you can, while avoiding a fatal third shotgun blast to your poor zombie head. Any feet that are rolled are added to the next roll, though you never toss more than three dice at a time. You can choose to stop, and add the current round’s number of brains to your running total, or get greedy and press your luck in order to get more. The first lucky zombie to obtain thirteen brains signals the end of the game, giving the rest of the undead only one more round to roll. Whichever zombie has eaten the most brains after this final round is declared the winner. If all this sounds very simple, it’s because…well, it is. But this is a game with tons of dice and a zombie theme. It doesn’t aspire to be Agricola or anything like that. 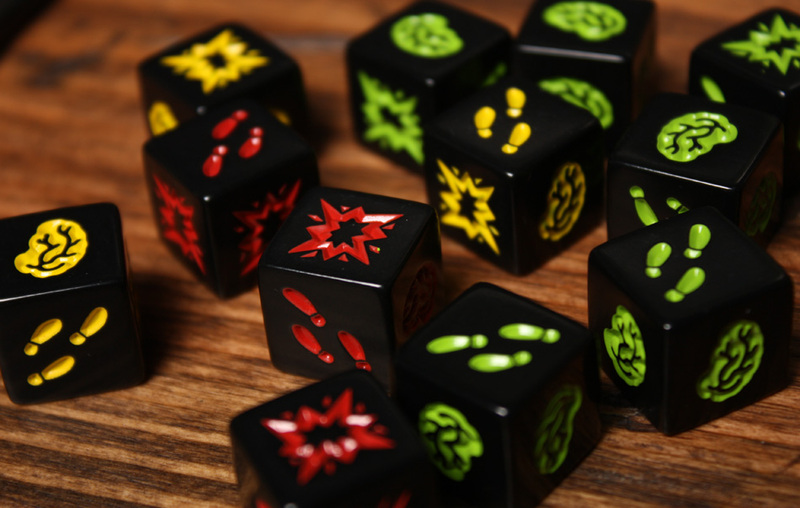 Zombie Dice is fast, fun, and a great way to open up a game night, or a nice filler in between heavier games. On to Zombie Dice 2, then. This sequel/expansion to the original just came out in the past few weeks, so I haven’t had too much experience with it yet. Even in such a short time, I have found Zombie Dice 2 to be average at best, arguably making the base game worse, which certainly isn’t what you want from a good expansion. Three new dice, each with unique colors and faces, are included in the package, along with a brief rules sheet. The three dice include a pair, the Hunk (white ink on black) and the Hottie (pink ink on black), as well as Santa Claus himself, represented by a red die with white ink. These unique dice represent characters you might find in a zombie movie, and swap out for yellow dice from the base game. You can use the pair alone, just Santa, or toss in all three to really mix things up. The Hunk is a very tough guy, indeed, with a super deadly double shotgun face. This risk is balanced by the fact that he has a two-brain face, which raises questions when you think about it, so better not ponder it too long. The Hottie is not as dangerous, but much harder to capture, with an extra foot face, meaning you’ll reroll her often. A special rule for the pair adds a bit of complexity. If the Hunk has been set aside for brain harvesting already, and you roll the shotgun on the Hottie, the Hunk is freed back into the dice pool to be rolled again. The Hunk can free the Hottie in the same way. It’s certainly cute, but I’m not sure if it really adds much to the fun. Santa Claus is one tough dude. He has the standard brain, feet, and shotgun faces, but also a double brain, a football helmet, and an energy drink. The double brains are apparently from Santa’s bag, which is creepy. The helmet lets the zombie player survive an extra shotgun blast, and the drink turns feet on green dice to brains. If you play Santa with the Hunk and the Hottie, he can rescue them, and be rescued as well. One odd quirk, though; Santa’s double brain face cannot be rescued, since they aren’t really his brains, they are gifts. Santa is even less fun than the other pair. The helmet is fine, but the odd double brain rescue rule and the energy drink effect don’t come up often enough to be worth the extra complication. The real draw for Zombie Dice is simplicity. It is easy to teach, to learn, and to play. The new dice add lots of new rules, but not much extra fun. The Hunk and Hottie alone aren’t that bad, with only the rescue rule needed to use them. But Santa Claus, with two brand new faces to teach and learn, and the bizarre rescue rule quirk, isn’t really worth it. The first game included lots of dice and a nice container, all for $13, while Zombie Dice 2 is $8 for just three dice. That is too much money for too little product, in my opinion. 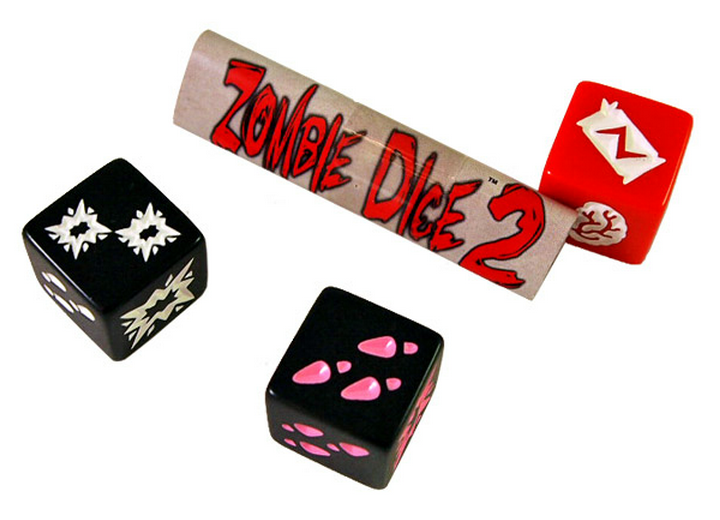 Unless you are a diehard Zombie Dice fan, you can probably skip Zombie Dice 2. Like most sequels in the horror genre it parodies, the expansion just doesn’t hold up to the original.